Spring is more and more closing in, and consequently more and more collections are getting unveiled each day. 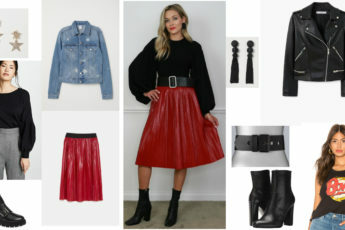 Now it’s Spanish label Bimba & Lola that comes to showcase its new season gorgeous creations and inspire its followers. The new Bimba & Lola spring/summer 2013 lookbook brings strong geometric touches, vintage shapes and tropical prints, as well as a nice play with volumes ” attributes that define the brand’s signature style. From lovely modest styles to elaborate pieces, the collection has something gorgeous for every style and liking, so we can safely say that the new season is going to be Bimba & Lola thoroughly. The new Bimba & Lola spring/summer 2013 collection is extremely multiform both in terms of the designs and the colors used. The color palette of the collection includes versatile blacks and whites, pastel blues and subtle oranges, as well as pops of vibrant purple, green, red, blue and yellow tones. There are both polished monochrome looks ideal for office-wear and for formal occasions, as well as lots of geometric prints, optical effects, abstract and tile prints, as well as polka dots, which are all included in the hot list of the spring/ summer 2013 print trends. Part of the Bimba & Lola spring/summer 2013 lookbook is dedicated to minimalist looks. Here, we see cropped slacks, sleeveless suits with above the knee tailored shorts, simple blouses and pant suits worn with a bra top underneath. Perhaps, the most alluring trend of the new season is the ’50s-inspired ladylike dress, which has found its special place in the Bimba & Lola spring/summer 2013 lookbook. There are charming dresses worn with metallic sandals or printed ones, as well as dresses worn over the cropped trousers. And here we come across the heavily printed and patterned pieces. Appearing on almost any kind of garment, from dresses, blouses and shorts to suits, trousers and outerwear, prints do dazzle in the Bimba & Lola spring/summer 2013 lookbook. This part of the collection is definitely not for shy girls, who try to always escape from look-at-me-now situations. Overall, a strong inspiration from Louis Vuitton is noted, which is evident in the checkered pieces featuring transparent fabrics and cut-outs. Those eye-popping printed pieces look especially chic in combination with lightweight chiffon blouses. Abstract is hot this spring, and the Bimba & Lola spring/summer 2013 lookbook shows a myriad of cool interpretations of the trend. There are skirts, dresses, blouses and pants with abstract prints and watercolor brush strokes. And if those pieces look too much for you, you can just go for an abstract printed scarf and brighten up your monochrome look. When it comes to the Bimba & Lola accessories, the newest collection shows elegant clutches and envelope bags, bags in geometric shapes and unusual forms, oversized handbags, metallic and printed heeled sandals and retro sunglasses. Uniqueness and fabulousness are the words for the Bimba & Lola spring/summer 2013 collection, and you can definitely look so, if you borrow your favorite style from the lookbook.